The 2015 OCB Summer Science Workshop was held July 20-23, 2015 at the Woods Hole Oceanographic Institution's Quissett Campus (Clark 507) in Woods Hole, Massachusetts. Information on this year's plenary sessions is listed below. Follow the workshop via webcast and on twitter #OCB2015! 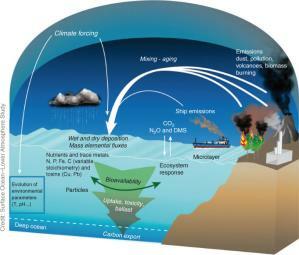 Session Description: Atmospheric deposition from natural (e.g., dust) and anthropogenic (e.g., ship plumes) sources represents an increasingly important source of new nutrients for many regions of the world’s oceans. However, links between atmospheric nutrient deposition, ocean productivity, and feedbacks to climate remain poorly understood. This joint OCB-SOLAS (Surface Ocean Lower Atmosphere Study) session will include an overview of natural and anthropogenic sources of atmospheric nutrients and their associated spatial and temporal scales of impact. Other topics of discussion will include atmospheric transport and mixing, wet and dry deposition processes, and the impacts of these new nutrients on marine biogeochemistry and ecosystems (stoichiometry, CO2 system, bioavailability, biodiversity), as well as potential feedbacks to the atmosphere and climate. Session Description: This session will provide a forum for studies across the globe that exemplify successful combinations of shipboard time-series coupled with autonomous observations. Speakers in this session will highlight scientific insights based on these integrated observing strategies. 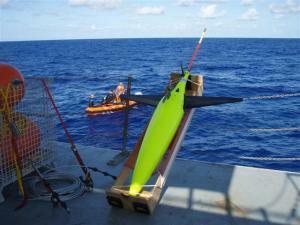 This session is timely, as the development and capabilities of autonomous biogeochemical sensors are progressing rapidly. As more biogeochemical sensors become available, shipboard observations will be essential for sensor testing, calibration, and validation. Likewise, shipboard platforms are relatively limited in their spatiotemporal footprint, so autonomous measurements can provide the opportunity to enhance our understanding of marine biogeochemical and ecosystem processes across a wider range of spatial and temporal scales. 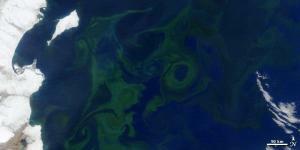 Image (based on MODIS data) of a plankton bloom near Kamchatka, AK on June 2, 2010 (courtesy of NASA). Session Description: The dynamics underlying the formation, maintenance, and demise of plankton blooms have been studied for a century now; however, the application of new technologies and approaches is redefining our understanding of the physical, biogeochemical, and ecological underpinnings of plankton blooms in the open sea. Remote and autonomous sensing technologies, new shipboard observations, and ocean modeling studies all continue to improve our quantitative and conceptual understanding of the significance of blooms for ocean biogeochemistry and food web interactions. This session will explore current approaches to understanding processes triggering the formation and maintenance of phytoplankton and zooplankton blooms, examine the fate of this biomass, and highlight gaps in our understanding of these dynamics. We gratefully acknowledge the support of the National Science Foundation and the National Aeronautics and Space Administration.